Having a pet is an important and enjoyable part of any kid’s life. Pets can be an excellent source of love, fun, company, learning opportunities, and preparation for the future. All parents should learn how to take advantage of all the benefits and great potential that having a pet can bring. The lessons that kids can learn from their pets can help them not only behave and act better right now, but to grow into responsible, mature adults that will have less psychological issues and be able to take on life successfully. How can parents achieve this level of success by incorporating domestic animals into their children’s lives? Here are some easy and simple tips that will help them do just that. Choosing the right pet for your child is a very important first step, and you should consider several factors when it comes time to decide. Taking your child’s age into consideration is crucial. Younger ones may do better with pets that require less care and attention, pets that are easy to handle and simple to take care of. The time that you and your family have is also an important aspect to consider when choosing an animal. You must calculate how much time you have to take care of the pet’s needs, and to supervise your child as well. If the entire family has a busy schedule and does not have time to walk, groom, feed and play with a puppy, then it is better to look for another option, at least for the time being. You should also take your child’s interest into account. If they have a specific preference, or have shown a certain interest in some animals, you should consider those a priority. Always take into consideration, however, that exotic animals do not make good pets for children, or animals that can be poisonous or have a strong tendency to bite. Good starting pets for busy families and young children may include turtles, hamsters, guinea pigs, and bunnies. Their faces will light up when making one of these a new member of the family. Everyone in the family, especially the children, should be involved in the care of their pets every single day. The young ones can learn to be responsible, timely, and considerate by learning how to feed their pets on a set schedule, giving them enough play time and attention, and making sure that they have a clean, comfortable living space. For example, a family with a puppy must make sure that their dog bowls are clean and filled on a regular basis with healthy food that will help the puppy grow and live happily for a while. 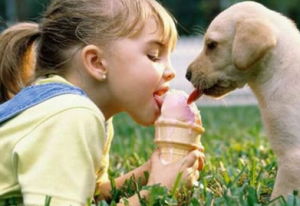 Teach kids about how much their pet should eat and how much is too much or too little. With a great sense of curiosity, playfulness, and desire to learn, children may not have a well trained sense of focus yet. In order to make sure that they properly take care of their pets, parents must make sure that they have and take the time out of their busy schedules to supervise their kids and make sure they are taking care of their responsibilities. If a child loses focus, or becomes uninterested in the care of the animal, parents should not simply take over. This will send the child the wrong message; that they can simply walk away from their responsibilities without any harm or repercussions. Having a pet is a wonderful experience, one that the whole family can enjoy, and that can be used as a valuable tool in the education of the child, teaching them responsibilities and important lessons that they will effectively rely on in their adulthood. Following these simple steps will ensure your family makes the best of having animal friends in the household.